Ethan M Lund traveled a lot and lived in Clearwater, FL but was staying in Emery, UT at the time of his death. 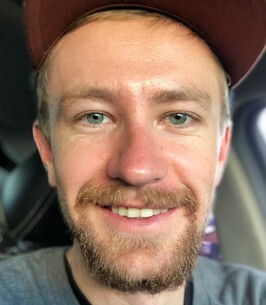 Ethan M Lund (26) passed from this earth on September 24, 2018. Ethan was born in Nephi, UT on January 12, 1992 to Merrell Glade Lund and Valenti (Cox) Kyner. Ethan was a journeyman for the Plumber and Pipefitter Union Local 123. He was baptized into the Church of Jesus Christ of Latter Day Saints. Ethan loved to fish, golf, camp, target shoot, cook, and travel. He loved being with his friends, listening to music, and taking photos. Ethan’s sense of humor, goofy smile, and good nature will be greatly missed by many family and friends. Ethan would often perform anonymous acts of service for family, friends, and strangers. Ethan grew up skateboarding all over Salina, UT and Grand Junction, CO. During the winter the snowboard would come out and he would be off to Powderhorn or Brighton ski resorts. Although Ethan was a good hearted, fun loving man, he suffered from depression. He fought this illness daily for many years before it became too much for him to bare. Ethan is survived by his father, Merrell Glade Lund (Melody Johnson) of Emery, UT, mother, Valenti (Cox) Kyner (Jeffrey Wynn Kyner) of Clearwater, FL, brother, Riley E Lund and half-sister, Samantha Marie (John) Witney, grandmother’s Pauline (Olsen) Wood, Marilyn (Greenhalgh) Steel, and Nancy Rae (Ball) Kyner, grandparents Kenneth Eugene Cox and Rosemary (Sherlock) Cox. Ethan also leaves behind 2 step-brothers and 2 step-sisters. Services for Ethan will be held October 6th, 2018 starting with a Celebration of Life at 190 North 300 West Ferron, UT at 11:00am, funeral services will be held at 70 North Center in Emery, UT at 1:00pm. All are welcome to both services. Interment will be at the Emery Cemetery. Friends and family may sign the online guestbook and share a memory of Ethan at www.fausettmortuary.com. To send flowers to the family of Ethan M Lund, please visit our Heartfelt Sympathies Store. We encourage you to share any memorable photos or stories about Ethan. All tributes placed on and purchased through this memorial website will remain on in perpetuity for future generations. My heart is saddened by the loss of Ethan. I will remember him fondly and consider myself lucky to have known such a kind, sweet and thoughtful young man. Ethan was a pleasure to work with, each time I saw him, I was met with a big smile and a hug! Rest in peace, Ethan, until we meet again. Ethan was one helluva good man. I worked with him for about a year and half and he always gave 100% day in and day out it was an honor to work with him. I remember him being upbeat and having a positive personality he was a great soul. I found out about his passing today and I am deeply saddened. He will be missed and never forgotten. I am so very sorry for your loss. I was so sorry to hear about Ethan, it just broke my heart.He had such a good soul. I can speak for all of us at Local Union 123, our thoughts and prayers go out to his family. RIP Ethan. Our thoughts and prayers and with Riley and his family during this tough time.